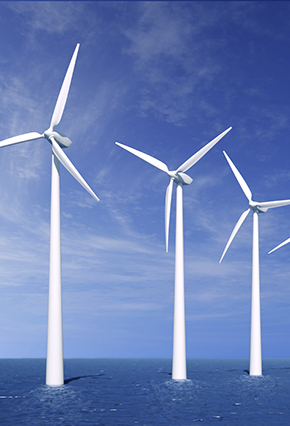 On June 17, 2014, Interior Secretary Sally Jewell, accompanied by Massachusetts Governor Deval Patrick and acting Bureau of Ocean Energy Management (BOEM) director Walter Cruikshank, announced that BOEM would make a new Massachusetts Wind Energy Area (WEA) available for leasing. The area, described in a Proposed Sale Notice (PSN) published June 18, is comprised of a 742,974 acre block on the Outer Continental Shelf (OCS) located approximately 12 miles offshore from Martha’s Vineyard. The new WEA would nearly double the area of the federal OCS available for lease to commercial wind energy projects. It would also become the largest contiguous offshore wind energy area in the U.S. BOEM proposes to auction the Massachusetts WEA over the course of four separate lease sales. The new Massachusetts WEA described in the PSN is just south of the area identified for the proposed Cape Wind project and just east of the Massachusetts-Rhode Island WEA. The proposed WEA encompasses an area 33 nautical miles long by 47 nautical miles wide, and was first proposed in a December 29, 2010 Request for Interest (RFI). BOEM partnered with the Massachusetts Renewable Energy Task Force to delineate the proposed WEA, and solicited public input in multiple rounds of comment periods, the last one ending on April 18, 2011. As a result of the RFI, ten entities expressed interest in the area and nominated OCS blocks. Following the RFI period, BOEM revised its proposed planning area and on February 6, 2012, published a Call for Information and Nominations. Following a comment period that ended on March 22, 2012, BOEM received ten nominations of interest from entities wishing to pursue commercial wind energy leases. On February 6, 2012, BOEM published a Notice of Intent to Prepare an Environmental Assessment (EA) to solicit input from stakeholders on the potential environmental and other impacts of making the WEA available for leasing. On November 2, 2012, BOEM published an EA and solicited public comment. On November 30, 2012, BOEM and the State of Massachusetts released an Announcement of Identification for the WEA, which contained 117 whole and 20 partial OCS lease blocks. Finally, on June 18, 2014, BOEM published the PSN along with a revised EA containing a Finding of No Significant Impact. Any wind turbines constructed in the Massachusetts WEA would be sited in water depths ranging from 35 to 65 meters. BOEM estimates that the entire WEA could support 10 wind farms, each capable of generating up to 500 megawatts of power. The PSN for the Massachusetts WEA is the most recent in a series of announcements by the federal government aimed at facilitating renewable energy development on the OCS. (For more information on these announcements, visit Van Ness Feldman’s Offshore Renewables and Transmission Practice page.) BOEM’s proposal to open up the Massachusetts WEA is significant because it nearly doubles the area available to entities interested in developing commercial wind projects offshore. It emphasizes the value the Obama Administration places on the future role of wind energy in the nation’s energy portfolio, and comes on the heels of the Environmental Protection Agency’s (EPA) June 2, 2014 publication of an ambitious new proposal to reduce greenhouse gas emissions from existing power plants. The EPA’s proposal relies in part on the potential for significant increases in renewable energy generation, including increased generation from offshore wind. The announcement is also significant because it demonstrates a concerted effort by BOEM to work with states and other stakeholders to consider a range of commercial, recreational, and environmental issues in its analysis of commercial wind energy areas. For example, the scope of the proposed Massachusetts WEA was informed in part by two working groups established by the state: a Fisheries Working Group on Offshore Renewable Energy and a Habitat Working Group on Offshore Renewable Energy. These working groups assisted BOEM in identifying areas to be protected from commercial development for wildlife and fishing purposes. BOEM’s proposal to open the Massachusetts WEA to commercial leasing is now subject to a 60-day public comment period that will conclude on August 18, 2014. Following the close of the comment period, BOEM will review and consider comments prior to publishing the Final Sale Notice. This notice will provide additional information on the process BOEM will use to auction the four WEA leasing areas. Entities interested in bidding on OCS lease blocks in the Massachusetts WEA have until the end of the public comment period to submit a qualification package. In order to be designated as a qualified bidder, an entity must fulfill BOEM’s legal, technical, and financial requirements. Van Ness Feldman provides offshore wind, hydrokinetic, transmission, and electric utility clients with unique expertise and hands-on experience in nearly every aspect of the project development process. In addition to our extensive work in land-based wind, solar, and hydroelectric energy project development, the firm represents offshore wind and marine hydrokinetic project developers on both the Atlantic and the Pacific coasts. The firm has also provided counsel on several proposed offshore transmission projects. For more information about our Offshore Renewables and Transmission Practice, contact Julia Wood, Jessica Friedman, or any other member of our Offshore Renewables team.